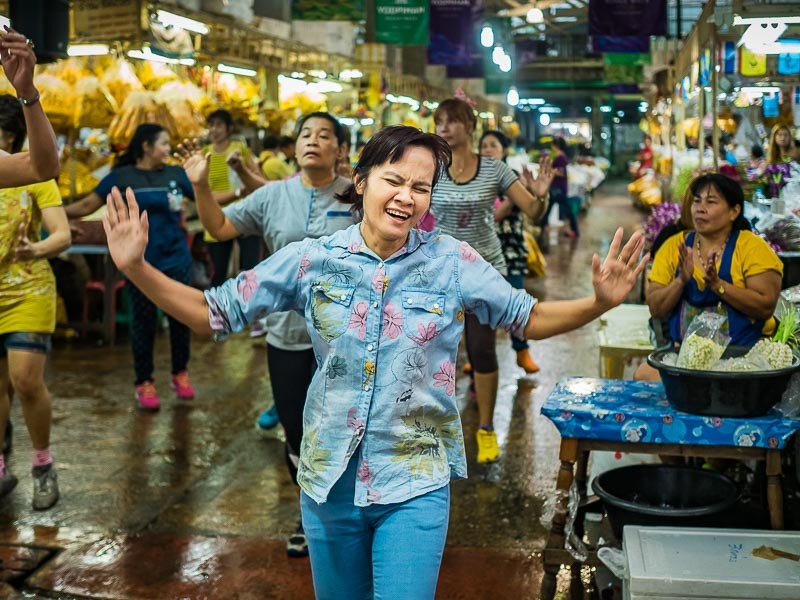 People work out during an exercise class in Pak Khlong Talat, the flower market in Bangkok. Exercise classes start in the market about 7AM. I went to the flower market Monday morning. 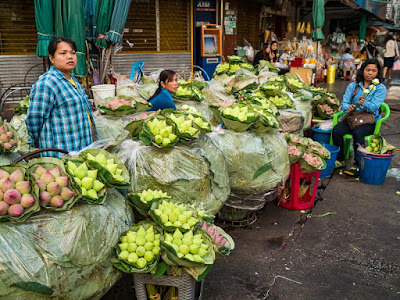 The flower market is a 24 hour market - it's always open, but it's busiest very early in the morning, from 3.30AM to 7AM. I got to the market about 5AM. 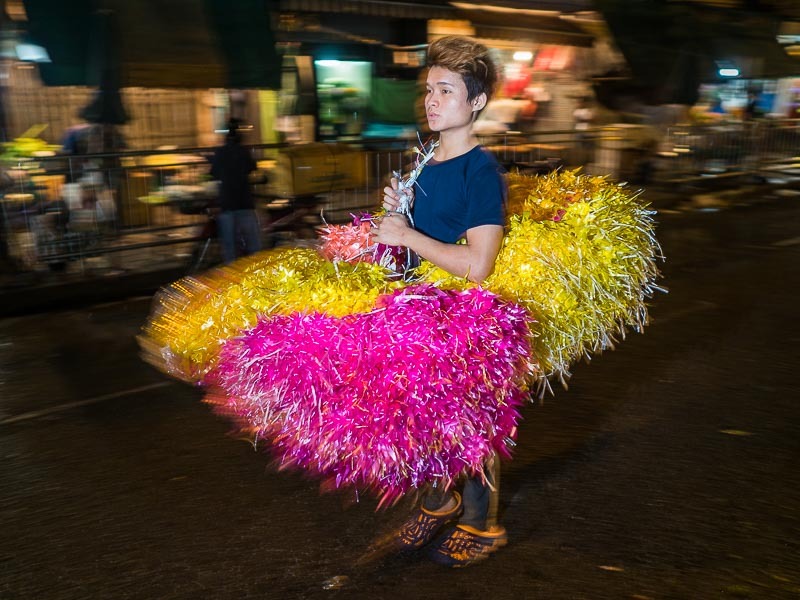 A plastic flower vendor walks up the street in the pre-dawn. 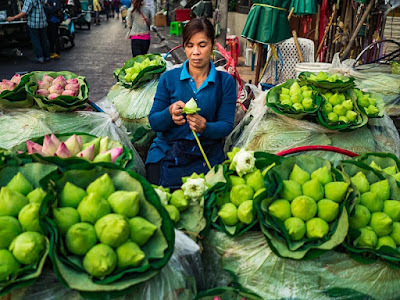 The flower market is a Bangkok institution. It's been a landmark for more than 50 years. Going way, way back, to the 1800s, it was a floating market. Then a "wet" market (produce and meat), then more than 50 years ago it transitioned to flowers and produce. 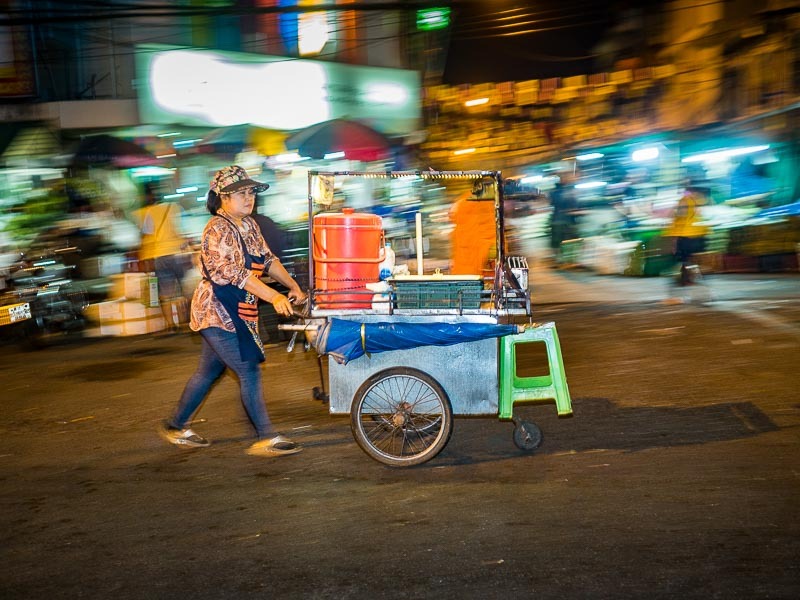 A woman pushed her food cart up to the street past the entrance to the market. Now it's transitioning again. Slowly but surely it's becoming less a flower market and more a tourist haunt. When I started going to the market, back in 2009, I seldom saw foreign tourists there. Now it's a part of Bangkok's tourists' trail. The market's riverfront has been ripped down and turned into a mall called the "Yodpiman River Walk," complete with Starbucks and Kentucky Fried Chicken. Bangkok officials have announced that the sidewalk in front of the market will be cleared as a part of their effort to "clean up" the city. 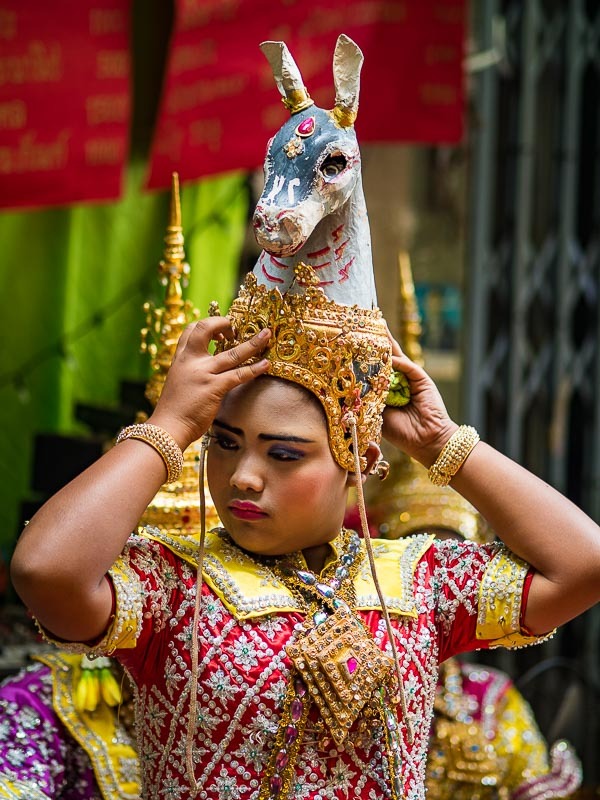 This follows shutting down parts of the amulet market, closing Bang Chak market, and evicting the vendors at Saphan Lek electronics and games market. 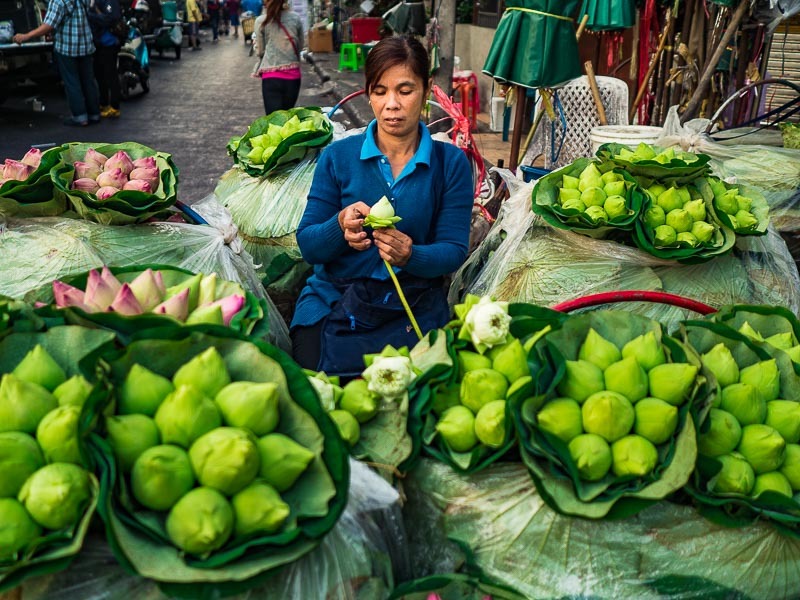 Selling lotus buds on the street near the flower market. Stalls like this one could be forced out when the city moves its clean up campaign to the flower market. People walk through the produce section of the flower market. This is in the covered part of the market and won't be forced to close. I hate seeing these old markets and street vendor areas being shut down. They are an important part of Bangkok's identity. Bangkok is an amazing city. It's a city with multiple personalities. There's the new Bangkok of the BTS and shiny malls, the one that appeals to tourists and wealthy Thais. 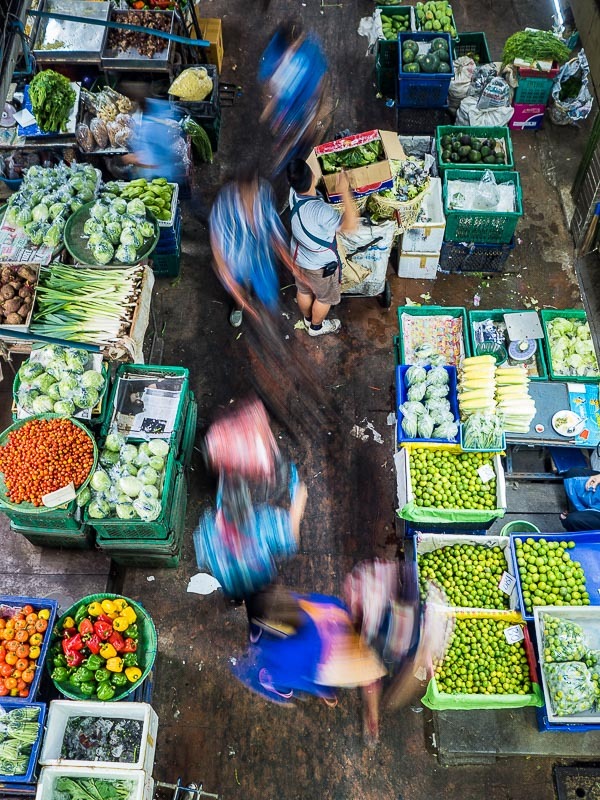 There's the old Bangkok of wet markets and narrow sois, the Bangkok where most Thais live. 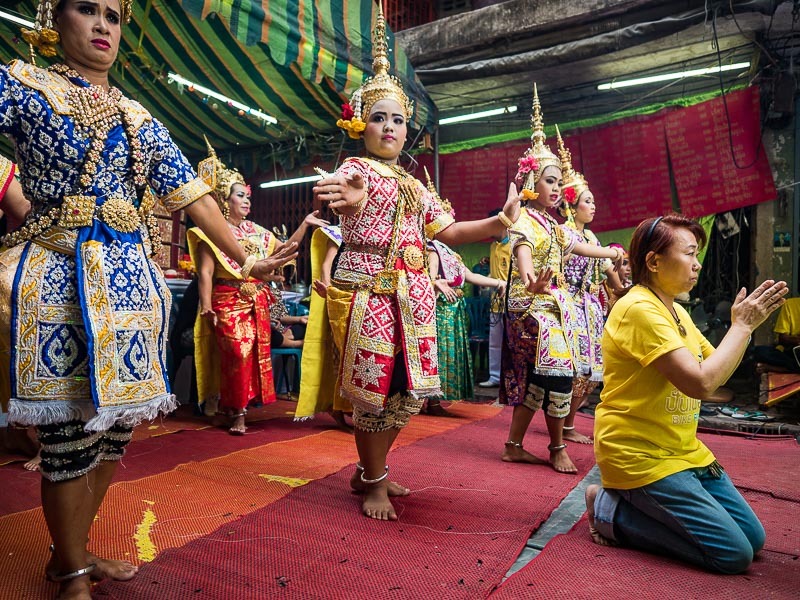 City officials seem to favor the new Bangkok over the old. 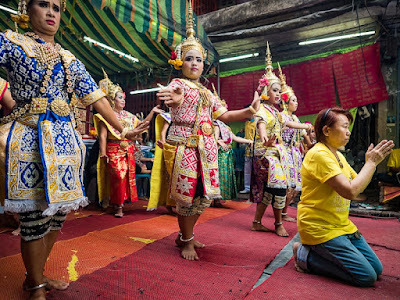 Traditional dancers perform at the rededication of a Buddhist shrine on a small residential street in the market. This is one of the joys of living in Bangkok. I went to the market because I hadn't been there in a while. I didn't know the shrine was being rededicated and sort of stumbled into the ceremony. If you want to see the flower market in its current version you should go sooner rather than later. The city's clean up efforts could start anytime in the new year. The covered parts of the market will probably be around for a few more years (albeit with encroachment from tourist oriented businesses) but the sidewalk vendors are a part of the market's charms and they'll be gone soon.